The sleek lines of the Rx-7 have been immortalized by many model car manufacturers, my list of Rx-7 miniatures keeps getting longer all the time. You can always find the latest news about RX-7 model kits on my Hot News page. If you're searching for a model kit of an RX-7, try the Kit Finder page. Even an older Rx-7 requires little maintenance, so there is plenty of time left for driving it and for other hobbies such as making miniature models. A few years ago I celebrated owning my Rx-7 for 25 years. 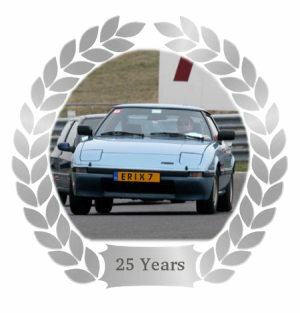 25 years of enjoyment, going full throttle on race tracks like Zandvoort, Assen, Spa Francorchamps, the high speed oval at Lelystad and of course on the Autobahn. Many long trips but even when puttering along in traffic jams, I keep enjoying driving my good old faithful little Rx-7. The RX-7 is Mazda's most successful rotary powered car to date. In the Netherlands the RX-7 was sold between 1979 and 1996. There are three generations of RX-7 models. My own Rx-7 is a first generation model SDX with factory sunroof and an optional glass Pacific Avatar 'Moon Roof', built in september 1981. In the Netherlands we have an enthousiastic club for RX-7 owners and admirers. On the Web a lot of information on RX-7's and Wankel engines can be found. If I want to discern between a first generation model Rx-7 and a later version I write Rx-7 to denote a first generation model whilst for all later models I write RX-7, since that's how Mazda put it on the badges on the cars ! Something I do for an even longer time then driving my Rx-7 is collecting and making plastic model kits. My first Rx-7 was, not surprisingly, a 1/24th scale Tamiya kit. Of course you could make models all on your own but joining a modelers club has many benefits. Club meets are a good way to catch up on the latest model kit news, share techniques and and information and get inspired to build even more and better models. More on making model kits can be found on my scale models page. This site only contains information about my hobbies, the information provided here may not always be complete or correct. I try my best to make the HTML code on this site compliant to the HTML standard as described at w3.org .